President Muhammadu Buhari has vowed to deal decisively with the seeming resurgence of oil theft, vandalism of pipelines and insecurity in the Niger Delta. Declaring that the Nigerian Armed Forces had already dealt “deadly blows” on Boko Haram, Mr. Buhari said the activities of oil thieves and vandals would soon be brought to an end, according to a statement by his spokesperson, Garba Shehu, on Tuesday. Speaking Tuesday in Abu Dhabi, the president warned telecommunication companies operating in Nigeria not to place their desire for huge profits above the security needs of the country. 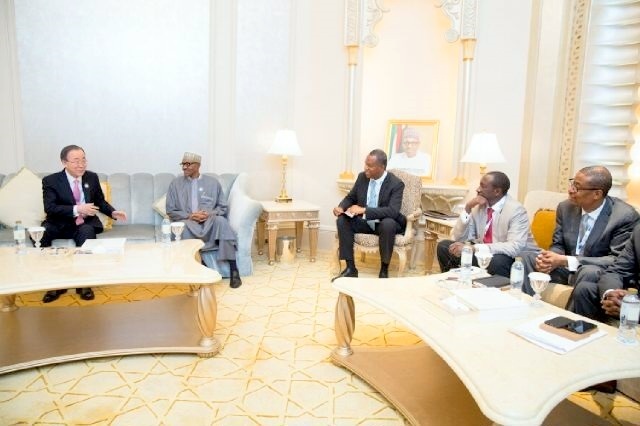 Speaking at an interactive forum with members of the Nigerian Community in Abu Dhabi, President Buhari said the war against terrorism can only be won with the collective effort and commitment of everyone. Remarking that the registration of all mobile phone users without exception will help the security agencies to pre-empt terrorist attacks, the president said telecommunication companies operating in Nigeria must adhere to the rules and guidelines of the Nigerian Communications Commission in this regard. ‎President Buhari assured Nigerians at the session that his administration’s war against corruption will continue to be vigorously pursued. The president pledged that more persons who have abused the public trust will be exposed and brought to justice soon, adding that his government was committed to re-establishing former standards of accountability and probity in the management of public funds which were jettisoned under past administrations. ‎The president appealed for more patience and understanding from Nigerians as his administration takes steps to safeguard the economy from the shock of falling oil prices. “In the face of our new economic reality of dwindling oil prices, there are a number of things we can really do without to preserve our economy. “We must develop the capacity to feed ourselves and we should be spending our resources on real development projects, not luxuries,” he said.